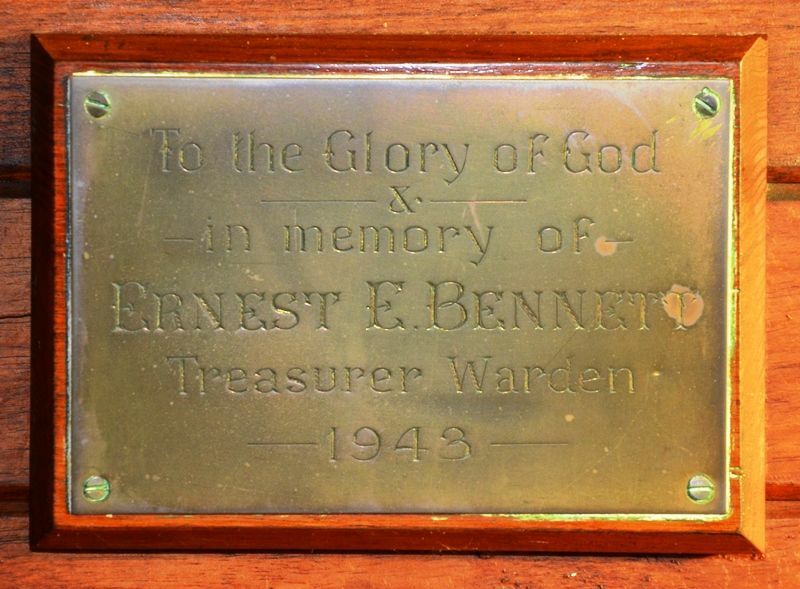 A plaque commemorates Ernest Bennett who was a layreader, treasurer and churchwarden. He was also secretary of the Lilydale Farmers and Fruit-growers' Association for some years and secretary of the local branch of the Tasmanian Producers' Organisation. He was appointed a Justice of the Peace and deputy chairman of the Lilydale Court. Ernest was also a sergeant with the Lilydale Volunteer Defence Corps and served for seventeen years as secretary of the Lilydale R.S.L., and was a member of the Loyal Pride of Lefroy Lodge. Note : As at July 2016, public access to the Church of the Ascension is no longer possible.